In a period in which the future of the European Union is subject to increased scrutiny, it is more vital than ever that the thoughts and views of younger generations are considered. Young People’s Visions and Worries for the Future of Europe: Findings from the Europe 2038 Project seeks to do exactly that, presenting the findings of a large-scale research project investigating the opinions and worries of young people between the ages of 16 and 25 across seven European countries. 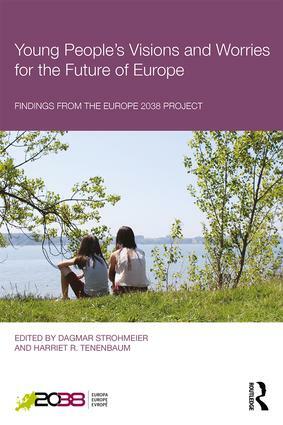 In this unique and timely volume, Strohmeier and Tenenbaum, together with the Europe 2038 consortium, examine young people’s endorsement of multiculturalism, diversity, European identity, human rights, and political participation, and unpick the cross-national differences in a range of European countries. Young People’s Visions and Worries for the Future of Europe concludes by formulating effective evidence-based recommendations for policy and practice. This work is essential reading for advanced level undergraduate and masters level courses in Psychology, Social Work, Politics, Sociology, Social Policy, and Education, as well as researchers in those fields. What predicts British young people’s views of Europe? How could young people’s belief system influence the future of Europe?